Step 1- Print out the 12 PDF files on creme colored cardstock (send me an email me if you would like the number files. The files will print best using Adobe Acrobat Reader to print correctly). Step 2 - Cut cardstock down the center (5 1/2"). 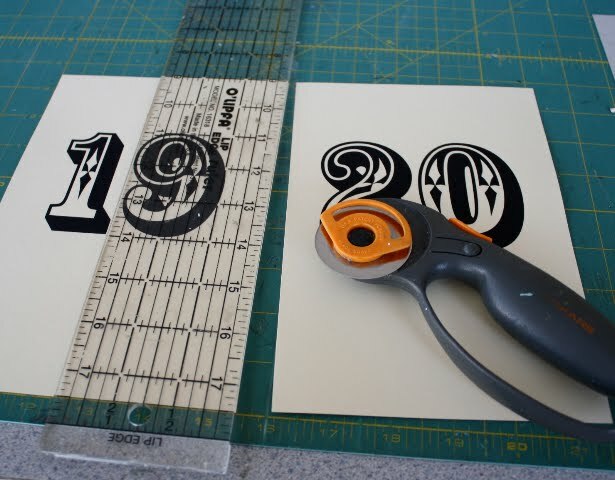 I use a rotary cutter for all my paper cutting because I get a good straight cut and I can cut in multiples. Depending on the weight of the cardstock, I can cut about 4-7 sheets at a time. 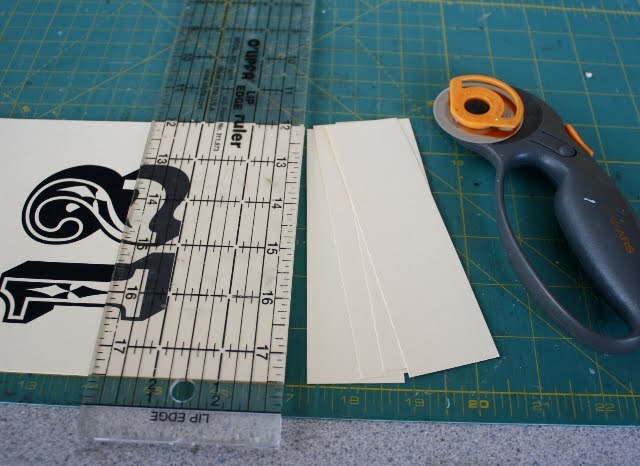 I also cut book board using this tool (but only one sheet at a time). This technique isn't for everyone but if you come from a sewing background like do you may already have the skill. the edge of the self healing mat board. 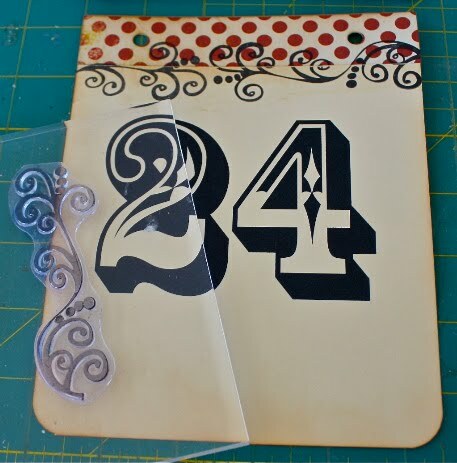 Step 3 - Cut off the bottom of each number so each card is 5 1/2 x 7". 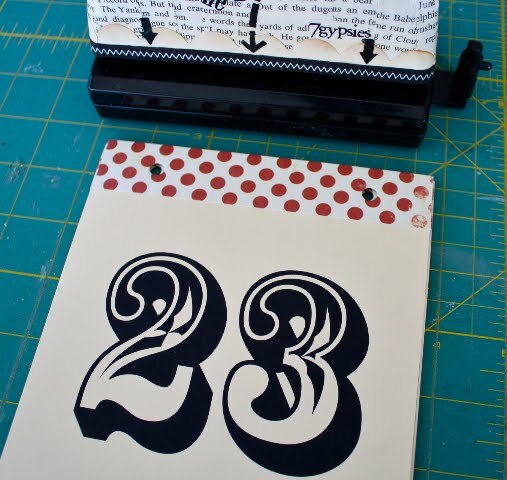 Use a corner rounder on the bottom two corners of the number card. Step 4 - Cut 24 (5 1/2 x 7") pieces of patterned paper for the back of each of the number cards. This is a great place to dig out all you red and green scraps. 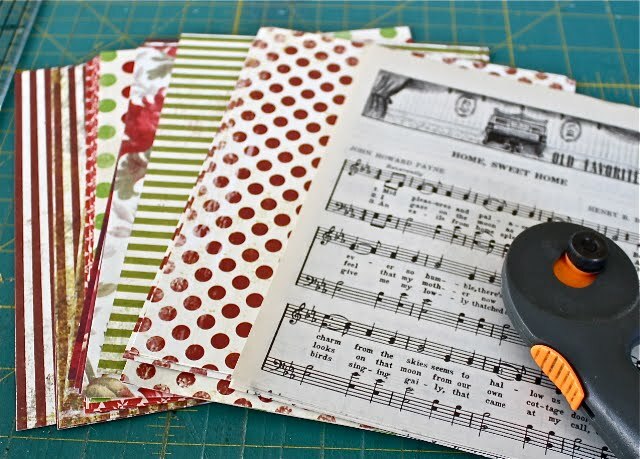 I even used old sheets of music and some black and white polka dot just to mix it up. Step 5 - Adhere the cut papers to the back of each number card. Step 6 - Cut 24 (1 x 5 1/2") strips of polka dot paper for the top of each card. Adhere to card before you punch the holes. Step 7 - I used my 7gypsies Binderie to punch the holes in this project. Remember, by now each number card has paper on the back and a small strip on the front. 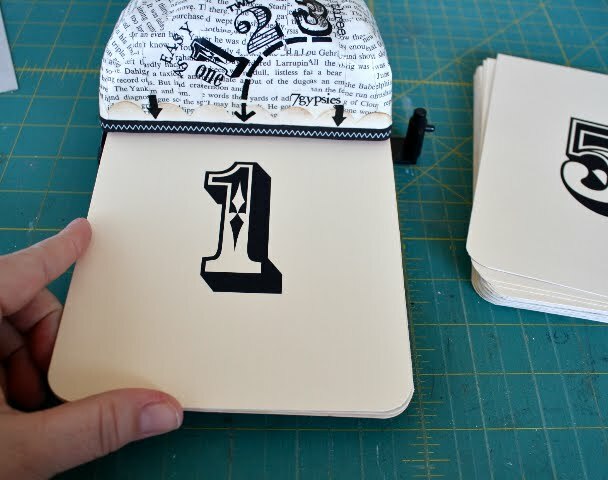 The Binderie will still punch at least 4 cards at the time, even at this thickness (and the holes will be in the right place every time). Fast and easy. Step 8 - Use black Staz On Ink to stamp the large swirl along the polka dot edge as well as the bottom. NOTE: I use Staz On ink with all my clear stamps because it doesn't stain. After I stamp I use a baby wipe to quickly wipe away any left over ink and it never stains the stamp. Never wipe on the cling side of the stamp. Step 9 - Cut 2 pieces of Chipboard 5 1/2 x 7" for the cover. Round bottoms the corners. Cover with paper on both sides. On a recent trip to Kansas City I bought a piece of Cavallini wrapping paper at Paper Source. I used that paper on the cover. 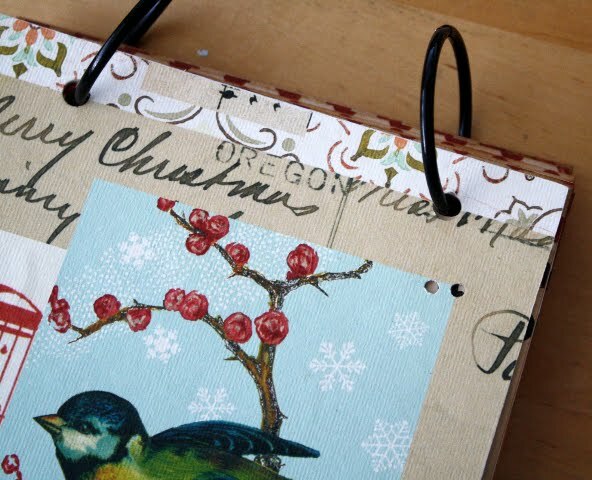 I use red polka dot paper from on the inside. Punch both covers with the Binderie. Step 10 - Punch two small holes in the cover for ribbon. 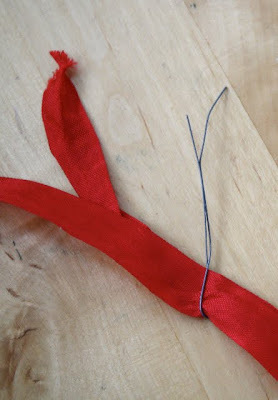 Fold about 24" of ribbon in half and thread through holes in the cover. 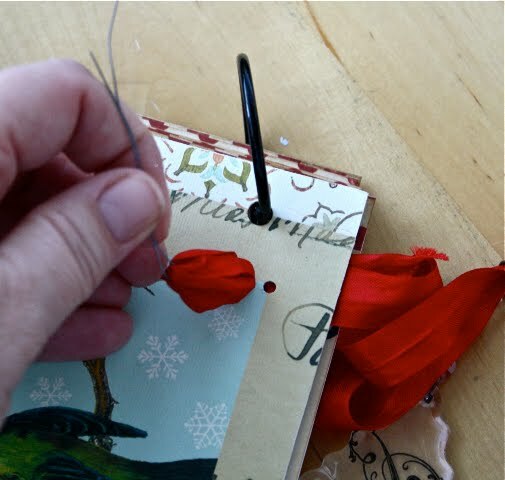 A tip I learned from Deb is to use a piece of wire to pull the ribbon through a small hole. Works every time. Step 11- Gather up pages and both covers into a stack and used two LARGE binding rings. I used black but this would look great with red. 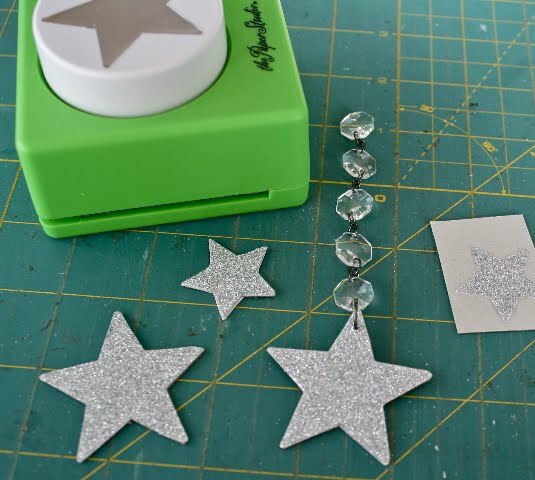 Step 12- I punched two sizes of stars from a sheet of glitter wrapping paper (I got that at Paper Source too) and glued them to chipboard then cut them out. I added another glitter star on the back to make it two sided. Of course can use real glitter if you don't have glitter paper. Punch a hole at the top of the star with a paper piercer and add a large jump ring. I used one package of Princesca hardware for all the crystal drops. 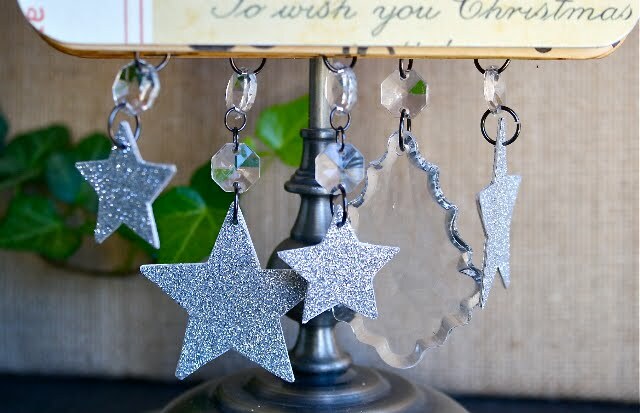 I just took apart the crystal links to create the hanging stars. Add stars and crystals to random pages of the book. Step 13 - Hang one large crystal from the ribbon on the cover. I added a rubbing to the crystal (that's a vintage 7gypsies initial rubbing from my stash). 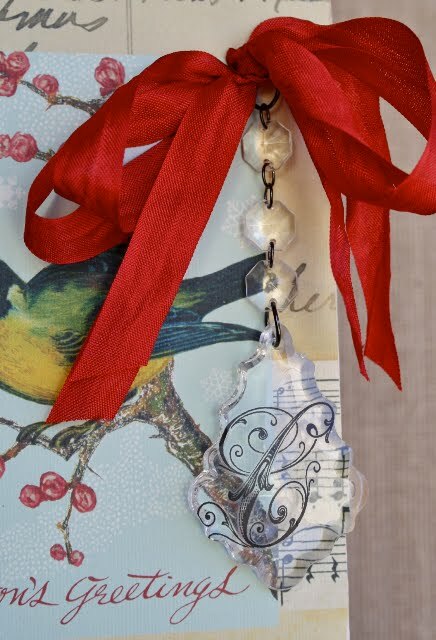 What a lovely project...thank you for sharing it! As soon as I get home from my holiday visit to my daughter I want to make this. I think it is lovely. Thanks so much for the tutorial. 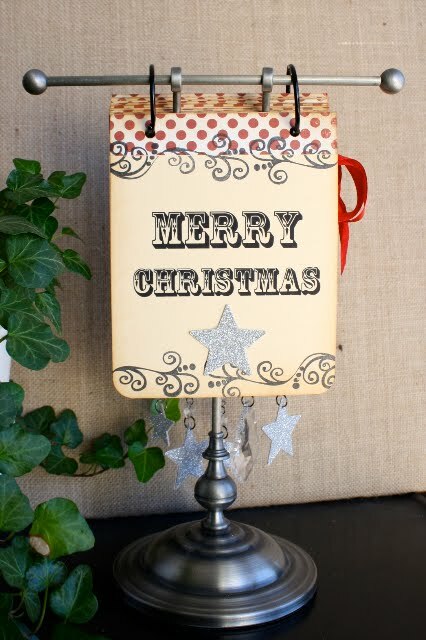 Hi Paula and Deb - Glad to see you have a blog now...I love your projects and the Christmas Calendar one is awesome ! Thanks for inspiring us. Hope you both had a Happy Thanksgiving. Hugs to you both from a CE '09 Attendee who LOVED your project and meeting you both. OMG love, love, love the new Countdown Calendar...and the blog...now we can really stalk you!! lol!! 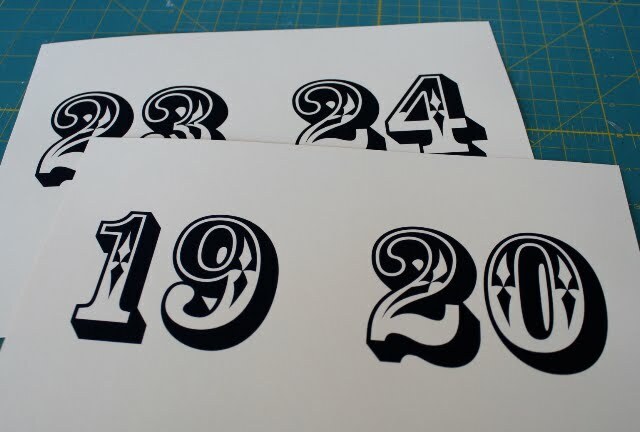 Please send me the font for those wonderful numbers to: kareyann74@msn.com. I hope you had a wonderful Thanksgiving. Just got back from Minnesota last night. It is freezing there. I brought Fifi with me, and needless to say, I was stopped every 2 minutes with her around my arm. I know this cuz I timed it. :)HAHAHAHA!! Hope to see you girls soon. Thank you for the great inspiration and I hope your Holidays are as beautiful as your project. Hey girls! Love that you have a blog. I am so excited for you. Your projects are near and dear to me - full of all my favorite things! As soon as I saw the countdown calendar....I immediately smelled another project on the horizon. I have four advent calendars in the works now ( almost completed! Glad to see you have Cathe Holden as an inspiration. Love her spool advent!) and I am determined to crank this beauty out in time for Christmas this year (don't laugh). As they say on the A Team..."I love it when a plan comes together..." haha! Happy blogging! I love this idea! I love 7gypsies products too. I incorporate them into my minis all the time. Wonderful, I love this AND I love the picture for the heading of your blog. This is amazing......I love every little "junky" detail of it! I cannot believe i had not found you before, but sure glad i did now. 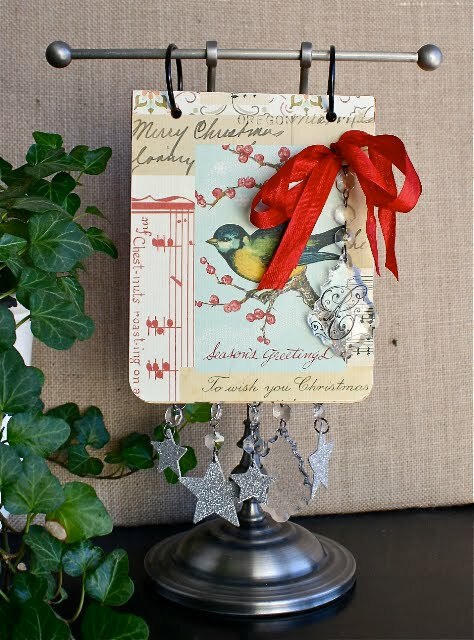 I would love to make this Advent Calendar, it is so perfect. Could you please send me the number file so I can print and get an early start? This is really lovely! What a great tutorial, too. 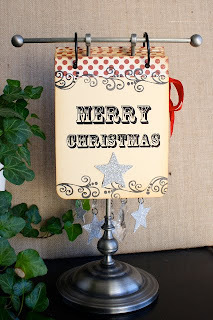 I'm including it in a Friday Favorites - Advent Countdowns post on my blog. Thanks for the inspiration! Thank you for this darling idea. I can't wait to make this over Thanksgiving! Please email me the number file at mikellebunker@gmail.com. I would love to do this with my daughter, could you please send me the number files at tatt2mama@gmail.com thank you so much!! 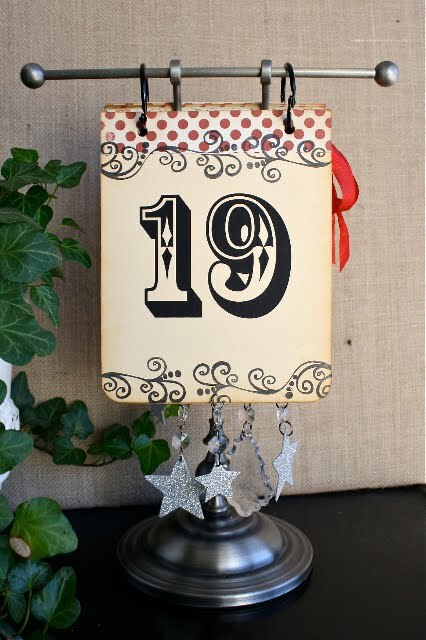 I created a countdown clipboard by decoupaging an old clipboard and have been looking for the perfect font for the numbers! Thanks!! LOve LOVE love this!! thank you!!! If you still have this PDF I would like to have it please.